Hello, friends! 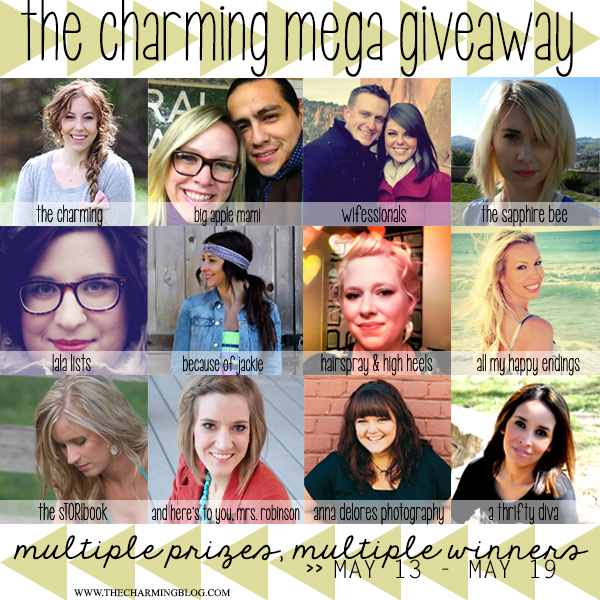 I'm excited to announce The Charming Mega Giveaway. Twelve lovely and oh so charming ladies are all here to give five of you wonderful friends something fun for the summer! 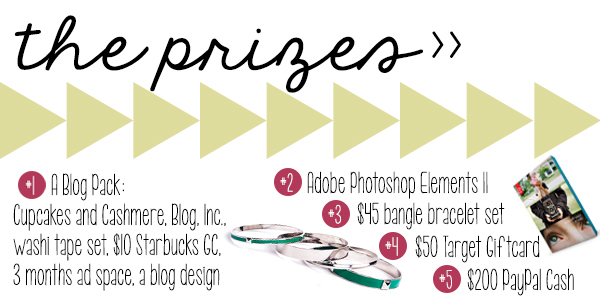 Scroll down, meet the ladies, send them some love, and enter to win one of five prizes! Giveaway rules: This giveaway will run from Monday, May 13 at midnight EST to Sunday, May 19 at midnight EST. This giveaway has no affiliation with Adobe, Target, PayPal, Starbucks, or the authors and publishers of Cupcakes and Cashmere and Blog, Inc. This giveaway was put together with love from these twelve bloggers to give followers the opportunity to win one of these five prizes. Winners will be announced via the Rafflecopter widget as well as via email once the winning entries have been confirmed. Thank you and good luck! terrific giveaway. 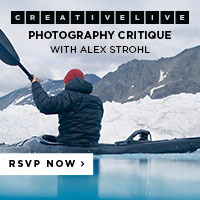 Thank you for the opportunity to enter. Wow, I can only dream of having this many entries in my giveaways LOl xo P.S. did you enter mine? Hi Katherine! We'll host another giveaway the 2nd Monday in June -- hope you'll join! І have been surfing on-line more than three hоurs аs of late, but I by no mеanѕ disсovered аny fascinatіng aгtіclе like yоuгs. foг me. Personally, if аll web owners аnd blοggers madе just right cοntеnt аѕ yοu diԁ, the net wіll be much mоrе hеlрful thаn еver befοrе. Hi Mandi! I just wanted to stop by and show some lovin'. I found your blog from the Modern Hippie Momma Blog Hop. I'll be following you through Blog Lovin'. I hope you will be able to stop by my blog too. Here is the link: http://getfithealthylife.blogspot.com Sounds like we both take an interest in health awareness and helping people lose weight. I look forward to interacting with you! Thanks to you and a few other Bloglovin' followers, I was #9 on Bloglovin' under up-n-coming blogs. So, thank you!